« Whiteheads in Vermilion Parish – borers, rats and a Friday mystery for you. When to treat for grasshoppers in rice? I’ve had a few calls about grasshoppers in rice – particularly in the south-central Louisiana. I called Mo Way (Texas rice extension entomologist) to discuss this with him. I know they had some trouble with grasshoppers in Texas earlier this season. As Mo said this is an odd year, so we are seeing some out of the ordinary insect problems. Here’s a little information about grasshoppers. Possible damage: Grasshoppers can cause defoliation, but unless you exceed 20% defoliation of rice that is actively growing and past the boot stage, then we would not generally recommend a treatment. Grasshoppers can also feed on grains as they develop in the panicle and this can cause blanking as grains mature – you might see a white, empty hull on a panicle. The grasshoppers cause this damage by feeding near the bract at the base of the grain. This damage is usually not severe enough to warrant a treatment. Long-horned grasshopper adult - this insect could damage the rice, or actually help out by eating rice stink bugs. Beneficial insect: Long-horned grasshoppers in particular (bright green with long antennae) are omnivores – they will feed on vegetation and also other insects. In some cases they can help to manage your rice stink bug infestation by eating the rice stink bugs. 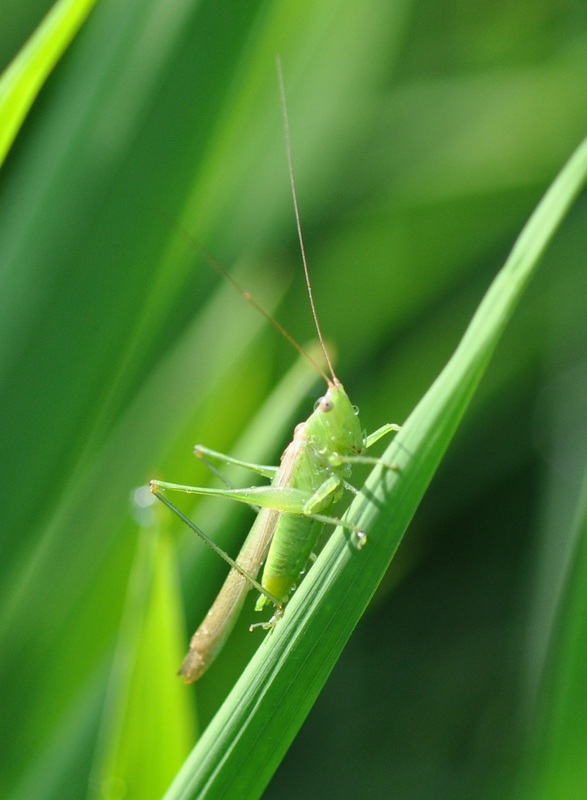 Recommendation: We do not recommend applying an insecticide for grasshoppers unless you are certain they are causing enough of a reduction in yield to cover the cost of a spray. It is possible that a pyrethroid application for rice stink bug or stem borer will also control grasshoppers. Please contact your local county agent, or me, if you have a severe infestation of grasshoppers and you feel it is causing damage to your rice. Hey man, I’m really interested in the grasshoppers that are affecting our crops. I’m currently a student at a USF and I wanted to do some research on the particular species that you have in the image. Do you have any information on the Spices of this Grasshopper or a source for the image? I no longer manage this blog, since I left LSU in 2012 and now work for Bayer CropScience in Germany. The image in the blog was taken by me. You can use it for educational purposes. Please credit me (Natalie Hummel) and LSU AgCenter. To learn more about these species, I suggest that you contact the LSU Department of Entomology. Somebody there should be able to help you find more information. Best of luck in your studies!